Dr. Wong holds the John S. Dunn, Sr. Distinguished Endowed Chair in Biomedical Engineering; he is also a Professor of Radiology, Pathology, Laboratory Medicine, Neurology, and Neurosciences, the Associate Director of Translational Research at Methodist Cancer Center, and Chief of Medical Physics and Chief Research Information Officer at Houston Methodist Hospital. In addition, he serves as the Founding Director of the Ting Tsung and Wei Fong Chao Center for BRAIN (Bioinformatics Research and Imaging in the Neurosciences) and Founding Director of the Center for Modeling Cancer Development at Houston Methodist Research Institute. He also holds a dozen of other academic posts across institutions in Texas Medical Center as well as overseas universities and medical schools. 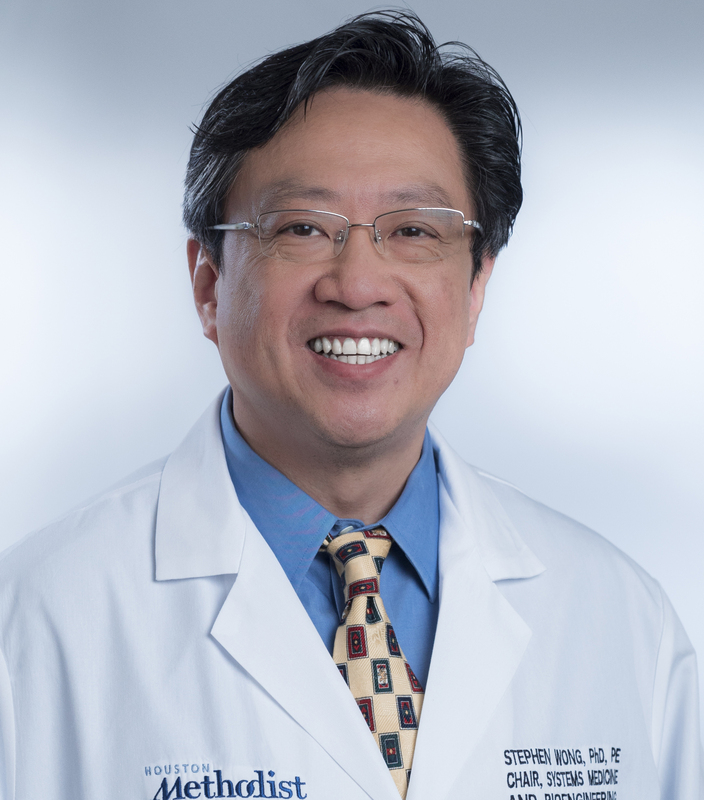 An internationally acclaimed bioengineer and imaging scientist, Dr. Stephen Wong has led teams that developed production automation for first very large scale integration (VLSI) 1MB computer memory chip and the largest online brokerage trading system, and contributed to the first hospital-wide digital radiology image management system in US academic medical centers. Dr. Wong has more than twenty years of research and management experience in industry and academia, including Hewlett-Packard, AT&T Bell Laboratories, the Japanese Fifth Generation Computer Systems Project, Philips Medical Systems and Royal Philips Electronics, Charles Schwab, University of California - San Francisco/Berkeley, Harvard University and Houston Methodist Hospital. He received his senior executive education from the MIT Sloan School of Management, Stanford University Graduate School of Business and Columbia University Graduate School of Business. He holds many patents and has published over 300 peer-reviewed papers and four books. He also serves on and chairs NIH study panels, conference program committees, and the editorial boards of twelve scientific journals. As an international authority, he is sought as a speaker on medical imaging, systems biology, healthcare IT, drug development, biophotonics, clinical neuroscience and other related topics. Dr. Wong's research focuses on understanding health and disease from a systems perspective in order to generate cost-effective strategies and solutions for disease management. His research approaches combine both experimental and high throughput biology with rigorous computational, bioinformatics, biophysics, and imaging methods to achieve a deep understanding of the functions of each component in biological systems and integration of them with multilevel systems analysis. For example, the consequences of genetic variation, cell-cell interactions and environmental factors are included to reflect the circumstances and microenvironments of the disease condition. Current research projects include pathway modeling and high throughput phenotyping approaches for target discovery and drug repurposing in combating neurological disorders and cancer, and for understanding the mechanisms of these diseases. Additional projects include reformulation of small molecule drugs using chemical biology approaches, the development of point-of-care molecular diagnosis and monitoring devices using biophotonics and nanotechnology techniques, and the development of label-free molecular image-guided cancer therapy platforms. Is pathology prepared for the adoption of artificial intelligence? Mikheev, A, Mikheeva, SA, Severs, LJ, Funk, CC, Huang, L, Mcfaline-Figueroa, JL, Schwensen, J, Trapnell, C, Price, ND, Wong, ST & Rostomily, RC 2018, . Huang, L, Mikheev, A, Mikheeva, SA, Rostomily, RC & Wong, ST 2018, .